learning and networking opportunities at D.I.C.E. PLEASE NOTE: You must have a D.I.C.E. All Access or D.I.C.E. Summit Full Pass to participate in the golf, go-karting, poker, MAGIC: The Gathering tournament, yoga, and entrance to the D.I.C.E. Arcade and roundtable sessions. Only the Opening Night Party, 22nd D.I.C.E. Awards and Awards After-Party are open to “Party Pass and Awards Pass” holders. 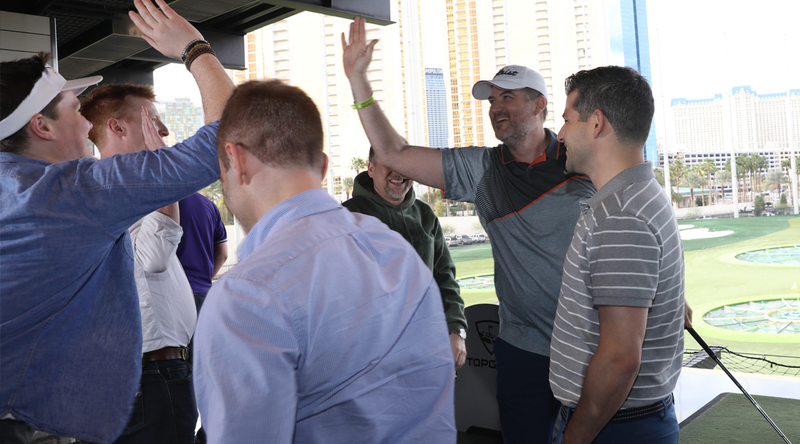 Topgolf, Las Vegas is back by popular demand! A four-level entertainment venue with interactive golf games and balls that score themselves, Topgolf is unlike anything you’ve ever experienced. 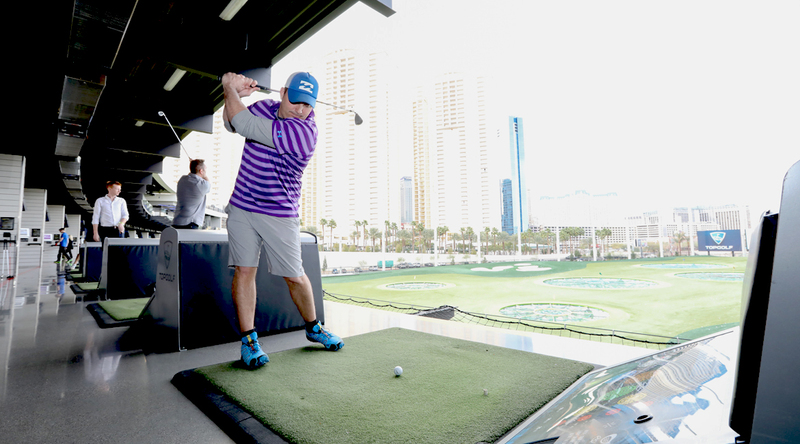 It features climate-controlled hitting bays, hundreds of HDTVs, games, delicious food and more. Transportation and lunch are included. Buses leave 12:15pm SHARP outside the Aria tour lobby near valet at the main entrance. 2019 marks the ninth year for the D.I.C.E. Summit Go-Karting Tournament. Please wear closed-toe shoes or sneakers. Transportation, head gear and lunch are included. The 2019 D.I.C.E. Summit will close its first day with the D.I.C.E. Summit Texas Hold'em poker tournament at the Aria. Heavy appetizers will be served. Pre-registation begins at 6pm. Tournament starts promptly at 7pm. New to D.I.C.E. this year is morning yoga to start your morning. Have an opportunity to stretch, focus and unwind before the day begins. Make sure to sign-up when you register, spots are limited! Silent Savasana™ is a transformative yoga experience lead by yoga veteran Dray Gardner. The signature class involves headphones to allow the student to deeply connect within during practice. Dray encourages taking time for yourself, even during a busy conference week. 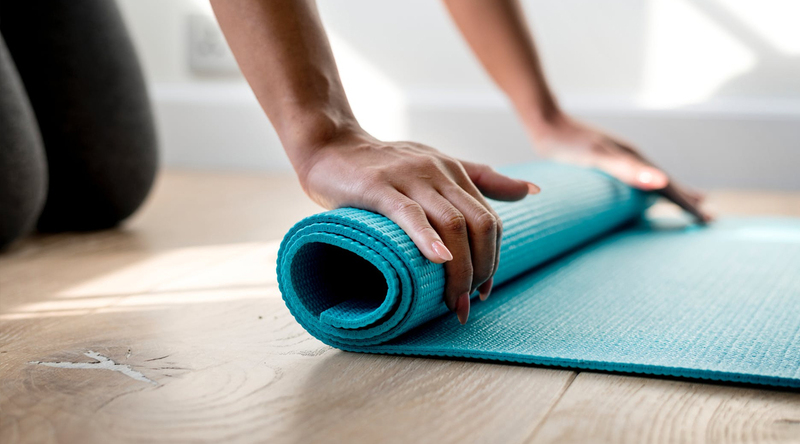 **Class includes headphones, playlist, mats and yoga assistant. For the third year at D.I.C.E., join in on a friendly competition of MAGIC: the Gathering between D.I.C.E. attendees. If you’ve played Magic before (at any level), we encourage you to join us for a special evening of networking through play! Decks, heavy appetizers and drinks will be served. Mix and mingle with your industry peers at the Opening Night Party. Don’t miss out. Food and drinks will be served. Don’t miss out on the D.I.C.E. Arcade. A networking hub where attendees can gather and have discussions and brain storm while sipping on a latte or playing pool or fuse ball. Roundtable break-out sessions are intimate, moderated group discourses where attendees can discuss amongst peers a variety of topics important to the interactive entertainment industry. You can read more about the roundtable experience here. Workshops are smaller, breakout sessions geared towards a greater level of audience interaction and sharing. Panels and discussions engage with an audience of approximately 50 people and emphasizes joint exploration of ideas and concepts relevant to the industry and workplace. Workshop sessions will be announced soon. D.I.C.E. Summit attendees, nominees and industry luminaries gather to celebrate the best games from 2018! The Awards will feature a cocktail reception and dinner buffet prior to the show. An unforgettable venue at Jewel Nightclub. Mix and mingle with your industry peers at this stunning venue. Drinks will be served. Enjoy your last night celebrating with the D.I.C.E. Awards winners and nominees.